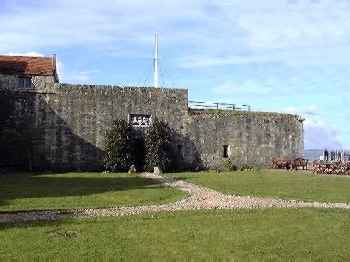 Yarmouth Castle is the last stone artillery fortress, founded by King Henry VIII but completed after his death in 1547. Originally within its square walls, there appears to have been a central courtyard, with the guns on the upper floors of the surrounding ranges. With the sea to the fore of the north and west walls and a moat encasing the south and east walls, a two storey 'arrow-head' bastion flanks the south-east angle. Modified to its present arrangement in the mid to late 16th century, on the northern, seaward side, an embankment is crowned by a gun platform and the courtyard with a range of buildings is along the south wall. An earthen bulwark, with bastions and revelins for further guns, was constructed outside the moat in 1597-8 and in 1609 additions were made including corner buttresses. In 1669 after the Restoration, the castle defences were reorganised, the moat was filled and the outer earthworks levelled. In 1813, rails were laid down on the parapet for four naval guns but in 1885 the guns were dismantled and the garrison withdrawn. 10 miles east is Carisbrooke Castle. Yarmouth Castle is located in the village centre, off Quay Street. 10 miles west of Newport on the B3054. The site is owned by English Heritage and is open, Wednesday to Sunday April to October 10:00-4:00pm.